Bitrixsoft Awards Aurora Information Technology, Inc. "2013 Partner of the Year: Innovative Medical Website Design"
COLD SPRING, NY--(Marketwired - Mar 19, 2014) - Aurora Information Technology, Inc. (Aurora IT) was declared 2013 Partner of the Year: Innovative Medical Website Design by world leader in web content management technologies, Bitrixsoft. 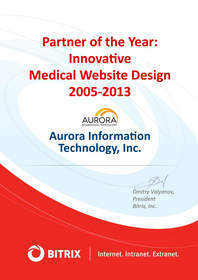 Holding this prestige since 2005, Aurora IT is an eight-time recipient of the award and is honored to be recognized for innovation in fully customized, integrated, and secure medical websites and content management solutions (CMS) for the healthcare industry. Bitrix Site Manager and Bitrix24 are the foundation of each medical website and intranet built by Aurora IT. From local practices to large-scale hospitals, Aurora IT provides the latest, scalable technology designed to meet the needs of healthcare professionals and patients. Backed by ten years of expertise in medical marketing and web design, Aurora IT supports healthcare organizations and medical practices of all sizes. Their team of marketing, creative, and IT experts works closely with each client on projects ranging from medical website design and medical logo design to customized software programming and intranet solutions. Aurora IT's sister company, CloudVisit Telemedicine, also backed by the Bitrix CMS, provides HIPAA-compliant telemedicine and telepsychiatry platforms for the healthcare community. "The face of medical marketing is changing," says Daniel Gilbert, CEO and president of Aurora IT. "Our partnership with Bitrix allows us to deliver the industry's best information solutions to our clients. Today, medical professionals are looking for the latest in design, technology, and guaranteed security. Using Bitrix software, we deliver this in a way that's scalable and affordable." Aurora IT utilizes Bitrix Site Manager to design innovative websites that healthcare professionals can affordably manage and even update themselves. Bitrix Intranet Portal Solution allows Aurora IT to support other businesses looking to optimize internal processes, information sharing, and document storing. It's the Bitrix CMS that Gilbert stands behind and trusts for his company. "Whether healthcare-focused or not, our clients' needs are that of every business. We help them enhance and promote their services in a cost-effective and direct way," explains Gilbert. "The difference for medical clients is that they're responsible for highly sensitive practice and patient information. It is of utmost importance that the solutions we design offer the best in data protection, and allow us to work in compliance with healthcare regulations." In a wide-reaching industry like internet marketing, medical websites that once did the job are now not pulling their weight. Search engine technology is constantly changing and optimizing an online marketing campaign requires industry vigilance about what it takes to build site traffic and continually increase hits. Not only does Aurora IT have that background, they also have their finger on the pulse of changes. They guide medical practices and institutions toward internet solutions that are more targeted, streamlined, and cost-effective. About search engine optimization, Gilbert says, "It is our responsibility to stay current on the latest trends and tactics of SEO. We develop quality website content that cuts through online clutter and drives our websites to the top of search engine results. That's a key component of practice growth for our clients." Aurora Information Technology, Inc. (Aurora IT) is located just 50 miles north of New York City in Cold Spring, NY. Doctors, surgeons, and hospitals around the world call on Aurora IT for their expertise in integrated medical website design, software programming, public relations, and online publishing solutions to help medical professionals succeed in a challenging marketplace.